Praised be to God, and Welcome! I am happy to welcome you to our school. St. Frances X. Cabrini School is continually committed to excel in its mission of integrity and truth, excellence and compassion and justice in the community since 1951. I know that the experiences and learning your child will receive will result to a successful future. St. Frances X. Cabrini School through its affiliation with the Dominican Sisters, chooses to teach and grow in the Catholic Faith through the charism and core values of the Dominican tradition. Each student is a witness to the call in a commitment to study, to pray; to build community and to reach out to others in need with a special concern for the young, the poor and the vulnerable of our world. Indeed, our parish school exists to promote in our students to value and live their faith, to speak boldly and write persuasively about that faith, and to be academically prepared to hurdle the hierarchy of education and beyond. I believe in Catholic Education and I am honored to be part of a parish that includes a ministry of a school that is on fire for the success of the children. The school’s Student Learning Expectations acronym is F.I.R.E. this stands for Faithful Christians, Innovative Contributor, Responsible Citizens, and Effective Communicator. To achieve the mission of the school we aspire and are committed to assist parents in their role as primary educators of their children. We believe that providing experiences of service and outreach as a way of enabling children to follow in the footsteps of Mother Cabrini is an indication of a strong, positive citizenship. Thank you for visiting our school website and your interest in our school. St. Frances Xavier Cabrini is not only the first American citizen-saint but she also lived and worked in Los Angeles and celebrated the silver jubilee of the order she founded, the Missionary Sisters of the Sacred Heart, in St. Vibian’s Cathedral in 1905. The church built in her honor started with Mass in the home of Mary Knauff, who as a child knew the saint. Father Paul Knoske was pastor when there were fewer than 200 parishioners and served the parish for twenty years. A second church was built in 1955 and the temporary structure was converted to extra classrooms for the school. Monsignor John Rohde served from 1981 to 1988 when the concept of team ministry was introduced. Father David O’Connell headed the parish during its golden jubilee in 1996. From 1997 to 2006 Father Anthony Gonzalez was the administrator. 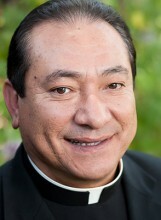 In July 2006 to date, Father Cesar Raffo serves as the pastor.